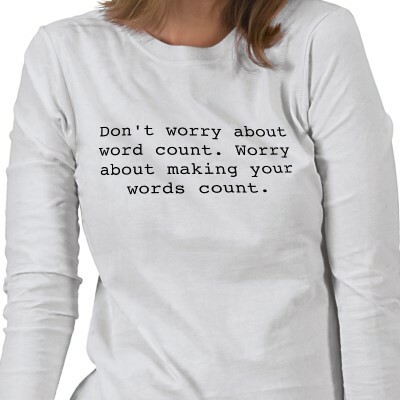 I have been driving myself nuts lately trying to figure out if all those word counts we hear about are referring to computer word count or traditional word count. Traditional word count meaning 250 x the number of pages in your manuscript when you use Courier New 12 point double spaced with one inch margins and 25 lines per page. Why, you ask, am I driving myself nuts? What's the big difference? In my current WIP, the difference is about 13,000 words. Yikes. One agent blog I follow wants traditional word count. But there was an #askagent on Twitter today (which means you ask a question followed by the #askagent hashtag, and agents answer! Very cool), and three agents all replied that they want to see computer word count. A few days ago I randomly Tweeted about it, wondering if anyone knew, and the overwhelming response was also computer word count. So there ya have it. Give them computer word count unless they ask specifically for something different. Most publishers are into computer count. This has been discussed on three lists I follow. I think this will now be the standard. I think you're right, Janet! I agree with Janet. Most places you're submitting to will be taking e-submissions rather than hard copy submissions these days, and so the count goes along with that. Good to know. Thanks, Shoshanna! Sure! I can't even tell you how many hours I spent researching all over the place, trying to find a definitive answer. Once I thought I found it, I'd read something else that said the opposite. But I think I kept searching because I *wanted* the answer to be traditional word count - but it isn't. LOL. Oh well.